An excruciatingly slow adaptation of the Ernest Hemingway novel, For Whom The Bell Tolls is obsessed with the romantic elements of the story and almost entirely ditches the essential Spanish Civil War political backdrop. Despite decent lead performances, at almost three hours long the film risks buckling under a crushing weight of saccharine-heavy tedium. 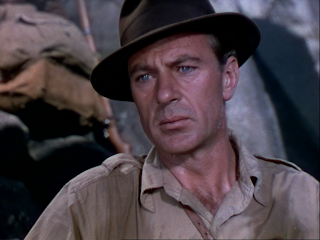 American Robert Jordan (Gary Cooper) is an explosives expert volunteering with the Republican side against Franco's Nationalist forces in the bloody Spanish Civil War. He accepts a dangerous assignment to blow up a strategic bridge high in the mountains. He has three days to plan the mission so that the sabotage coincides with the start of a key Republican offensive. Robert travels to the secluded mountains near the bridge and connects with a small group of civilian Republican sympathizers and gypsies, led by Pablo (Akim Tamiroff) and Pilar (Katina Paxinou), who are to help him with the mission. Also in the group is Maria (Ingrid Bergman), who was rescued by Pablo and his men after being held captive by the Nationalists, but Pablo is now gradually losing his will to fight for any cause and is more interested in saving his skin. As Robert plans for the destruction of the bridge, he and Maria fall in love as Pilar takes effective leadership of the group, although Pablo remains an erratic and sometimes dangerous presence. Cooper does a reasonable job as the world weary but still dedicated volunteer fighting for a cause he believes in, and in a short nod to the political background of the story, gives a short speech about the evil Nazis and fascists using the Spanish Civil war as a training theatre and proving grounds for larger conflicts to come. 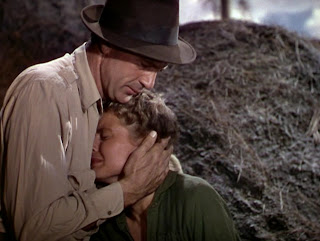 But otherwise, most of For Whom The Bell Tolls is a prolonged and almost interminable romance, Cooper and Bergman exchanging long, slow and earnest sweet nothings in the shadow of the looming studio-created mountains. Bergman as Maria holds her own as a pure victim of the war amidst all the fighting men and women, director Sam Wood perpetually bathing his leading lady in pure bright light to make her luminescent skin glow while everyone else struggles against the darkness and the grime of cave survival. Akim Tamiroff and Katina Paxinou deliver earthy but uneven performances as the locals grappling with a disruptive conflict much bigger than their simple existence, their proud heritage and their survival instincts clashing in an internal battle as fierce as the war. Tamiroff is sweaty enough but finds it difficult to make sense of Pablo's frequent attitudinal changes, his shady and questionable machinations matched by the equally incomprehensible indecisive reaction of the group to his frequent betrayals. Paxinou received the Academy Award for Best Supporting Actress, and although Pilar is a good role model for women taking charge in a man's world, most of what Paxinou does is colourfully over the top by more modern standards. 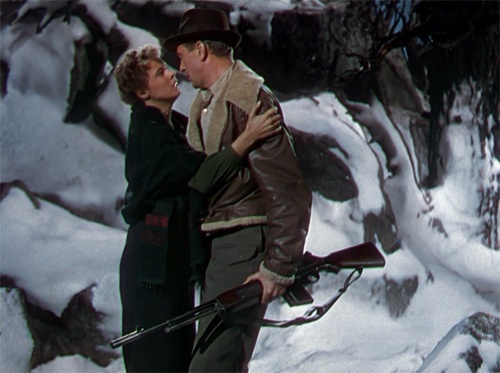 For Whom The Bell Tolls features a couple of action sequences which temporarily bring life to the movie. In the first Republican allies engage in a lengthy mountaintop battle against Nationalist troops, a well executed sequence that highlights cunning and sacrifice before ending in an impressive display of air force fire power. 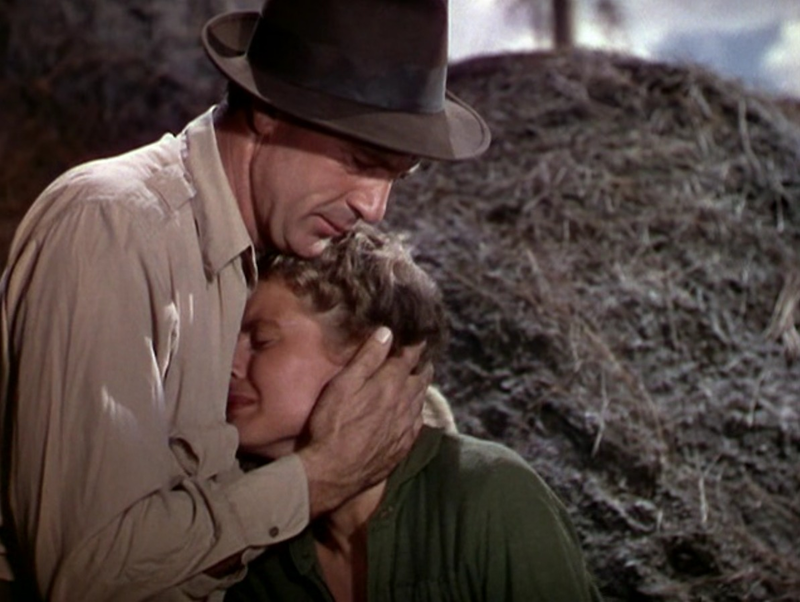 The second eruption of violence is the 30 minute climax to the film, as Robert finally puts romance aside and proceeds to the actual mission of trying to blow-up the bridge and engaging enemy troops. This one is a bit less convincing, but nevertheless improves upon the drabness of the apathetic pace that precedes it. At the end of the battle the big bell does toll, mostly to signal final relief from a story that sometimes dings but mostly dongs for far too long.